Do 3 burpees after every 5 broad jumps. If you have a 20-lb. vest or body armor, wear it. 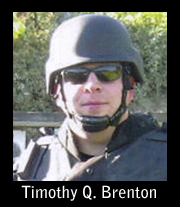 Field Training Officer Timothy Quinn Brenton, 39, of the Seattle Police Department, was shot and killed in a drive-by shooting while on duty on Oct. 31, 2009. He is survived by his wife, Lisa; son, Quinn; and daughter, Kayliegh.